I worked with few real estate agents before meeting Arezoo (Iris) but I didn't receive the level of services that I was expecting. What I was looking for in an agent was to guide me to the right direction, provide me with an expert opinion and be professional. A friend of mine, based on his several successful experiences, referred me to Arezoo. In every step of house searching, Arezoo provided me with accurate information about the neighbourhood, the market value and the house integrity. During the offer process, she assisted me to put an offer that was workable and had a high chance of sign-back. She was also strategic with the negotiation process which helped in successfully closing the deal for me. Arezoo continued her support and services until the closing and responded to all my inquiries promptly. She is professional, reliable, friendly and extremely knowledgeable. 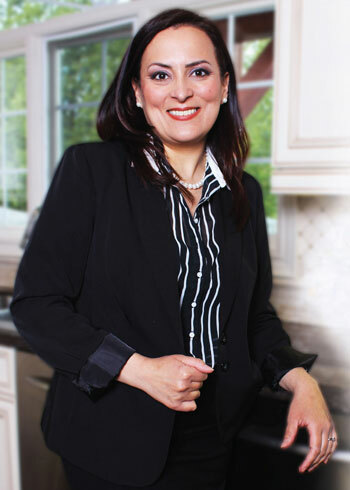 It was a great pleasure working with Arezoo and I highly recommend her to anyone who needs help with real estate. I want to take this time to thank you from the bottom of my heart. Who knew that years ago when you door-knocked on my house in Richmond Hill, that we would still be on this journey together and I would now be living in Barrie? If you remember when I first met you in 2013, I had interviewed other real estate agents and it came down to your team or Paula Minuti’s. But you and I had an instant connection! When I saw how professional you were, that you were on time and that you did everything to provide a service with the highest level of excellence, I knew that I could trust you with one of the biggest decisions of my life, selling what was so important to me. And not only did you sell my house in a challenging time, but with your approach and staging, a bidding war was created and I received over $20,000 more than my asking price. You are truly amazing! When I decided to lease a condo in downtown Toronto for my new job, there was no doubt in my mind of which real estate agent to call and once again you found me the right condo for the right price and you were supportive from the very beginning, to the very end. Over the years we have truly developed a friendship that is based on mutual respect and trust and so this summer when I decided to make the move to Barrie, of course without hesitation I called you. Understanding the sensitivity of what I was walking through in my personal life, you knew that this would be difficult for me. Regardless, you rose to the challenge, held my hand through the entire process and looked for the best house, in the best neighbourhood, for the best price. I even experienced some challenges with my mortgage broker before the closing and you were right there to support me and provide advice to me that set my mind at ease. And then after the closing, when it should have been the most exciting time, I was so overwhelmed. This was the third house that I had purchased, but the first resale and so I was not prepared for the mess, the appliances, the furniture and all the additional stuff that the Seller left behind when she moved. Most agents would not have cared, because the house closed and they would have already received their pay cheque, but not with you. You became involved because you see every client to the very end to ensure that their experience is truly the best. And so when my lawyer said that I could take the Seller to small claims court, you said that you would not only schedule, but cover the cost to have all of the junk removed. Wow, what real estate agent goes that above and beyond? When the junk removal team came and removed everything, I literally sat on my couch that afternoon and cried because I was so stressed out, didn’t know how I was going to do it, but you had come through for me and I had peace of mind. Iris, you and your team are truly amazing. You leave no detail undone, you build a repour with your clients where they can trust you and feel safe with your leadership. I will hands down recommend you to anyone looking to buy or sell their home. From the bottom of my heart, thank you for everything that you have done for me this far and please know that when I buy my next home, I already know who to call. My family and I met Iris over 7 years ago. She helped us during a very tough time in our lives when we had to rush to find a suitable home. Our first impressions were great. She is super friendly and easy to work with. She always puts in the time and effort and is very honest and knowledgeable. She always had our best interest in mind and did not rush or make us feel pressured or stressed in any way. Even when we were ready to settle for something, she would push us to keep searching for the perfect place. Since our first purchase with her, we knew we would keep using her services in the future and were very happy when Evelyn & Iris joined together. Between us all, we have purchased 5 properties with them and their services did not end there, they also helped us find tenants, contractors and mortgage brokers. They truly are a full-service team. Together they have decades of experience and will always go above and beyond for their clients. Iris, thank you so much for all your help and support over the years and working tirelessly to get us the best deals! We really appreciate you. "Thank you for helping us to sell our house! It was rough and emotional, but the house got sold in this market. So many houses are still on the market. It really feels good to be able to move on!" " Originally convinced that I could sell my condominium unit on my own, Arezoo Iris Khodkar proved otherwise with her professionalism, hard work and dedication. Hiring her was one of the best decisions I have made. If you are thinking about selling your property on your own, I strongly advise you to reconsider and instead speak with Iris. Not only did she save me the hassle of going through showings, offers and negotiations, but she also helped me achieve the sale price I had in mind. It was well worth the Investment!" "When I began looking for a new home, it was a little nerve racking and overwhelming. I had so many questions, thoughts, and hesitations while scrolling through properties to find what would be best for myself. Luckily for me, working with Iris helped me tremendously. The most comforting thing was knowing that Iris was a simple phone call away. she promptly would answer all of my questions and address all of my concerns extremely quickly and efficiently. She had taken the time to take me through step by step processes, educate me on closing, and refer me to the right people for further assistance. If you’re looking for sincerity, a hard worker, someone who makes you a top priority and passionate about finding you the right property, Iris is the person you want to work with." "Iris has been so helpful on selling my home. She shows care, patience and professionalism by putting her clients are her first priority. She is always available and on time. You wouldn't have to worry about not being able to get hr help when you needed her. She worked so hard to get out property sold at the best price. Thanks so much for your help Iris!" "Our first contact with Iris and Evelyn was a face to face chat in front of our home. We knew from that initial meeting that we found the right realtors to sell our home. They both made sure to ask my husband and I what we were looking for and took the time to get to know our family. They were extremely personable, professional and knowledgeable. Iris went above and beyond helping us sell our home. Her team were always quick to respond and act on new developments and were available any time of the day or night when needed. Their expert advice and experience were invaluable. My husband and I found both to be extremely pleasant to work with and most importantly, completely honest in all their dealings throughout the process. We feel that their use of a home staging consultant and professional photographer added to the quick sale of our home. Iris and her team sold our home within days of the listing! They are kind and true Gems!" "I have been with Iris for the last few years and she always puts my concerns in priority. She cares a lot about her clients and goes beyond their expectations. I personally recommend her to anyone who is interested in Real Estate Investment." "Wonderful Iris helped me buy my first home in Canada. When I started looking, I had no idea what I wanted, where I wanted it and how much I could afford. She patiently walked me through the process, step by step. The process took about a year. After finding the perfect home, she took the lead to negotiate with the seller leading me to eventually purchase the property at an unbelievable bargain. In my experience, Iris was not pushy at all. She does not try to make a bad deal look good. She listens to what you want, thinks about it and finds what you like. All that aside, the best part of my experience was that she took ownership of her work and was always available. Your phone call never goes to voicemail and your emails are replied within 10 minutes. If you want an agent who feels like an ally, someone you could trust in this messy city, call Iris!" "I've worked with Iris on two different occasions. Every time I work with her, I'm more impressed with her than before. She is very committed to her work and cares about her clients. She went the extra mile to make sure I was happy with the services and deals I'm getting. It makes me feel extra special when she calls to see how I'm doing even when we're not working together." By: Brandon and Monika G.
"We are so thankful we decided to go with the Iris’ Team at RE/MAX to sell our triplex. They are extremely organized, responsive, professional and knowledgeable of the market. They sold out house super fast. We would highly recommend them to anyone looking to buy or sell." What comes to my mind the most important about your service, is how patient you have been with us! I know that we were indecisive at times and very picky and selective, but that is just the type of people we are. We do not make our decisions very lightly. Thanks for taking the time to see all the many places we have seen together. We have seen so many places, that I probably cannot even remember most of them now, but I really appreciate all the appointments you came to with us. I thought it was very good service as well that my family could come along to some visits as well, and that you answered their questions and concerns as well. I know that my family have felt that you have a lot of experience and can give some good, honest, and real advice. I think overtime, you got to know me and Mahyar better as a couple, and knew the right advice to give us, especially in that Emerald purchase, where we almost jumped into it immediately, because it was so rushed for time. You were right, that we needed more time to make our decisions, and did not want to be competing with anybody and raising prices or overpaying for no reason. I think we also feel that you are a very experienced agent. That was obvious from the beginning. On top of that you seem like a very strong-willed and smart business-woman and that made us feel that your negotiation skills would help us out when we would need it the most. And I'm sure that it did. It was your personal idea of course, to suggest the World On Yonge project. It turned out to be a great suggestion. I think we had overlooked that place because it wasn't the 100% ideal location, but in the end, I feel that the value and size of our new place is simply more than we would ever have had in Gibson, Emerald or Hullmark, especially for that price. You yourself have a unit there, and your family, and obviously you feel the same way, that you are getting more space for less and a better living situation in the end. We were really focused on the other projects I mentioned and perhaps needed to expand our horizons a bit to get the actual ideal unit itself. I'm really glad you suggested that, even though it was not our idea at the time. The unit we have now is completely ideal for us, extra rooms, space, storage space, which I think you know is very important for me! I know you had to be very patient with us overall, and you managed to do so, even though I'm sure that you are really busy and have many clients to assist. In the end, you made us feel that you truly care about our place and wanted to help us to finally get our place faster with the deduction from your commission. I really appreciate that, and it was a great final touch in the whole transaction. Thank you again for all of your help, and I'm sure you know that we would gladly recommend you to other clients aside from our own families as well.
" Iris and her team are true professionals who are in tuned with the market trends. They came prepared with a well thought out plan on what our house is worth in comparison to the current local market value. Their pleasant nature and their accessibility made the whole process seamless. I will not hesitate to use their knowledge again in the future"